AES Governor and AES D&I Chair Leslie Gaston-Bird moderates the recent AES New York 2018 Diversity and Inclusion Committee Town Hall session with guests Terri Winston, Piper Payne, Ezequiel Morfi and Agnieszka Roginska. Highlighting the successful initiatives of the Audio Engineering Society and partner organizations, the AES Dublin International Pro Audio Convention will feature the AES’s first-ever Diversity and Inclusion Committee Town Hall Meeting in Europe. 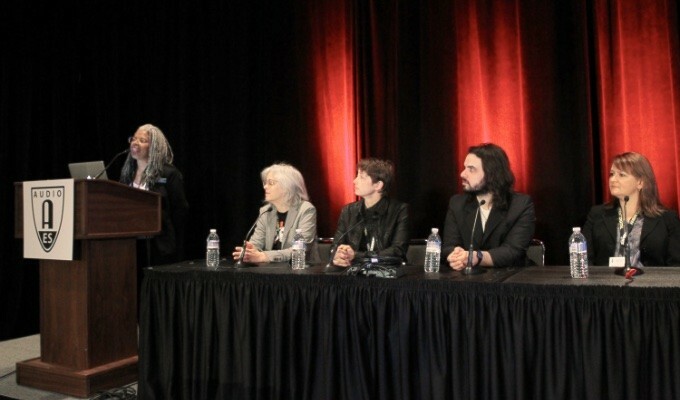 The Diversity and Inclusion Town Hall will focus on gender equality in the audio engineering industry, highlighting recent activities surrounding the United Nations’ HeForShe campaign and the related work spearheaded by Town Hall moderator Mariana Lopez, University of York and AES Dublin Co-Chair “It is a chance to learn about those activities and to add your voice to the conversation,” says Gaston-Bird. Joining Lopez and Gaston-Bird on the Town Hall stage will be AES President Nadja Wallaszkovits, AES President-Elect Agnieszka Roginska, AES Vice President Latin American Region Cesar Lamschtein, Big Bear Audio founder Charlie Slee, and iZotope Education Director Jonathan Wyner. The Committee will also host a Diversity and Inclusion Party on Friday, March 22 during AES Dublin. The event will be open to all Convention attendees – tickets can be secured with an RSVP at https://www.eventbrite.com/e/aes-di-party-tickets-57030025341. Advance Registration pricing and options on AES Dublin registration, including substantial discounts for AES Member and students, ends March 8. More information about the AES Dublin Convention and registration is available at aeseurope.com. Advance registration ends Friday, March 8, for the AES Dublin International Pro Audio Convention, Europe's premier pro audio education and networking event. There’s now more time to save up to 20% on All Access and Product Showcase badges for the AES Dublin International Pro Audio Convention, with Advance Registration pricing extended through March 18. Whether planning on a single-day visit to the convention or maximizing the experience with All Access admission to the full four days of Technical Program events, Professional Sound Expo presentations and more, attendees now have additional time to register for the premier European pro audio education, technology and networking event of the year. The convention’s theme, “Excite Your Ears,” will be exemplified through more than 120 sessions featuring over 100 audio professionals from around the world sharing the latest research, technologies and techniques in audio engineering applications. 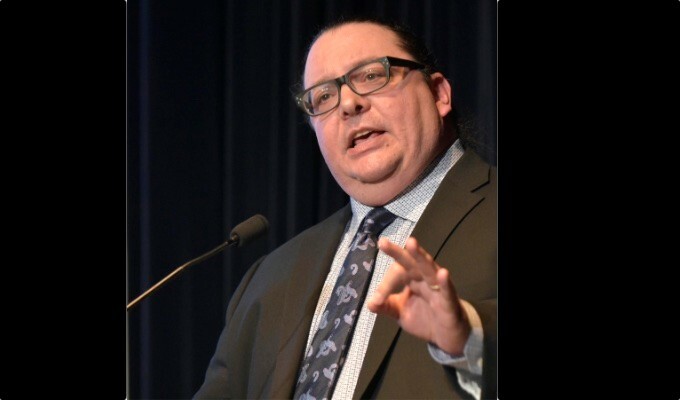 Presented in a variety of educational and interactive formats, these presentations invite attendees to listen, learn and connect with peers and colleagues representing the finest minds in audio. To save both money and time in the registration lines in Dublin, attendees should register online before Advance Registration closes and registration resumes onsite. Complete convention details and online registration can be found at aeseurope.com. Dublin is the 2019 destination for Europe’s preeminent professional audio education and networking event – the 146th International Audio Engineering Society Convention, March 20 – 23 at the Dublin Convention Centre. Covering all things audio, including Studio Recording, Live Sound, Networked Audio, Broadcast & Streaming, Music Production, Post-Production, Game Audio, Spatial Sound, Audio for AR/VR/XR and Product Development, the AES Dublin Convention will offer attendees exclusive opportunities and interactions with the top names in audio engineering and technology. 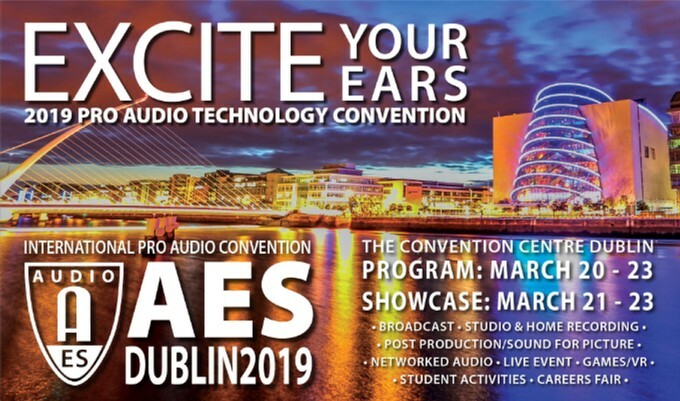 At AES Dublin, professional engineers, researchers, educators, students and audio enthusiasts can “Listen, Learn and Connect” to take their audio engineering knowledge to the next level. Registration is open now at aeseurope.com. AES Event News, Call for Contributions, Section News, and more, inside! AES Governor, Past President and popular convention presenter Alex Case will share the Tutorial "Snare Drum Strategies: Record and Mix for Maximum Impact" as part of the AES Dublin All Access Technical Program. The recently announced Tutorials program at the AES Dublin International Pro Audio Convention will provide a concise overview of hot topics, technologies, and best practices in audio engineering. Three-dozen dedicated Tutorials sessions give attendees flexibility to choose areas of interest from sessions spanning traditional recording and sound reinforcement, along with emerging technologies including spatial audio, new audio delivery methods and more. Led by leading names in research, design and engineering, Tutorials sessions will offer meaningful data and insights into areas of study with sessions ranging from “Modern Music Production for Immersive / 3D Formats” and “Microphones – Can You Hear the Specs? A Master Class,” to “Emotive Sound Design in Theory” and “Almost Everything You Ever Wanted to Know About Loudspeaker Design.” Along with additional AES Dublin Workshops, Papers, E-Briefs and Poster sessions, these topics and much more will be covered within the convention’s intensive Technical Program and related events, available with All Access registration. Online Advance Registration pricing and options are available through March 8 for All Access badges, with significant discounts for student and AES Members. For Tutorials and full program and registration information for the AES Dublin Convention, taking place March 20 – 23 in Dublin, Ireland, visit aeseurope.com. David Griesinger to give the Heyser Memorial Lecture, titled "Learning to Listen," at AES Dublin International Pro Audio Convention. Griesinger’s 50-plus years of experience in the professional audio industry covers a range of disciplines and fields of study, from product design and measurement to scientific research on sound modeling and perception. He is well known as the developer of iconic reverb algorithms and processors while Chief Scientist at Lexicon and is both an AES Fellow and an AES Silver Award recipient. "David Griesinger is one of the most influential researchers of our times,” says Steve Hutt, AES Technical Council Chair. “It's hard to imagine that there is anyone who listens to music that hasn't experienced the application of his pioneering work on reverberation. It's an honor to have David join us in Dublin and share experiences and insights that have informed his career." A full description of Griesinger’s lecture and his bio can be found in the AES Dublin online program pages at www.aeseurope.com. 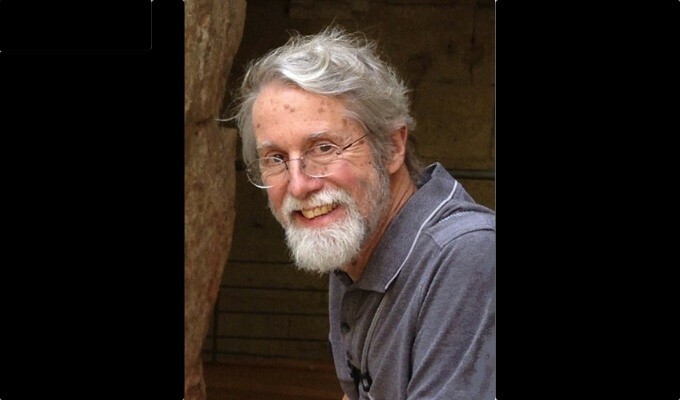 The Richard C. Heyser Memorial Lecture series, hosted by the AES Technical Council at each convention, honors the extensive contributions to the Society made by Heyser, who was widely known for his ability to communicate new and complex technical ideas with great clarity and patience. As part of the Convention’s Special Events presentations, the Heyser Lecture is open to all AES Dublin attendees. For more information about the AES Dublin Heyser Memorial Lecture, as well as additional Special Events, the complete Technical Program, the Product Showcase and advance registration discount and options, visit aeseurope.com. 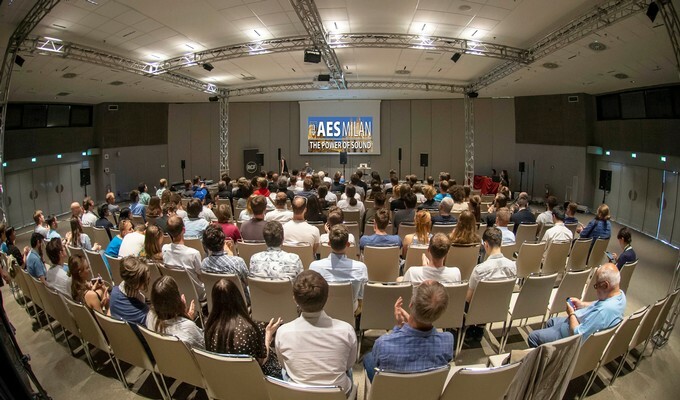 Workshops, like this multichannel session from last year's AES Milan, are integral to AES' international conventions. 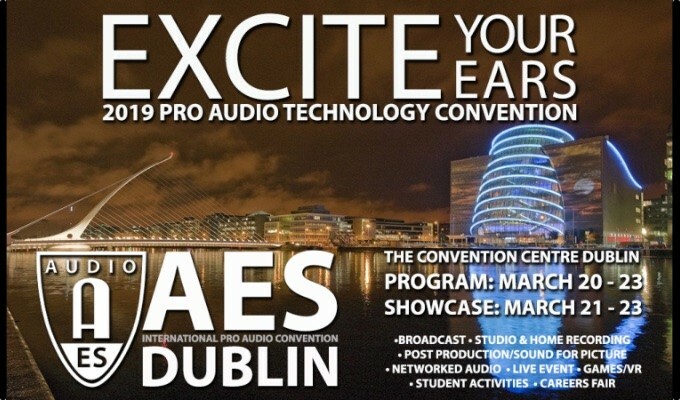 The AES Dublin Pro Audio Convention 2019's Workshops will be featured in the Technical Program, spanning March 20-23. The full AES Dublin Workshops schedule is available online at www.aes.org/events/146/workshops/, along with the full Convention Technical Program and registration information. Alongside the Workshops’ in-depth investigations of audio applications and practice, the AES Dublin Technical Program includes Tutorial presentations on fundamental and advanced audio engineering topics, themed Paper and Poster sessions illuminating breaking audio research, Engineering Briefs that share the processes and results of audio research and application projects, and a broad slate of student focused events. Advance Registration pricing and options are available through March 8 for All Access badges – the ticket to AES Dublin Workshops, as well as the complete Technical Program. For more information about AES Dublin, and registration, visit aeseurope.com. Prospective students and employees attend the AES Student and Career Fair during the 2018 AES Milan Convention. The Audio Engineering Society’s 146th International Pro Audio Convention taking place March 20 – 23 at the Convention Centre in Dublin, Ireland, promises more ways than ever for students and those new to the industry to listen, learn and connect with top names in audio engineering and technology, with the promise to “Excite Your Ears.” In addition to qualifying for free entry to the Product Showcase and select Special Events, AES Student Members are eligible for up to 75% off All Access badges during the online Advance Registration period ending March 8. 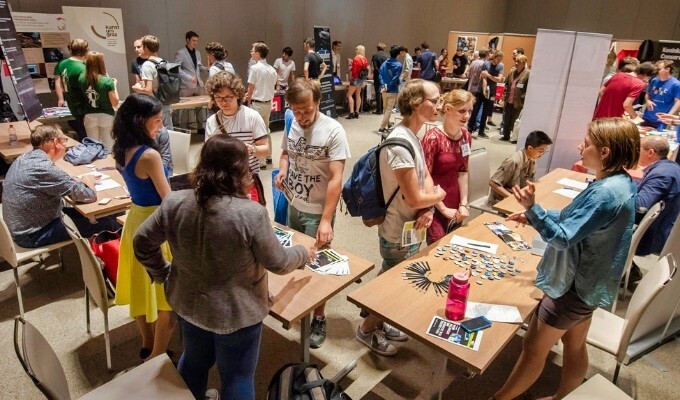 The Convention offers dedicated student and career development presentations to All Access attendees, as well as networking events and social activities (including the AES Student Party to be held the evening of March 20), and opportunities to be a part of recording and technology design competitions. The Society’s burgeoning student community is one of its most valuable assets, and nowhere is this more apparent than with the Student Delegate Assembly (SDA) – the representative body that plans and manages student convention activities while providing those involved the opportunity to learn organizational and leadership skills. Student Delegate Assembly meetings bookend Student and Career Development events at AES Dublin, serving as the operational hub of Society’s student involvement, including SDA election proceedings. 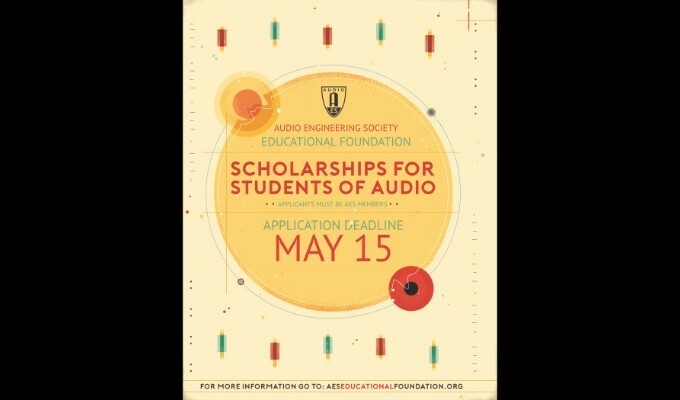 AES Conventions offer an array of educational opportunities designed to inspire the next generation of audio engineers to their highest potential, including specialized presentations allowing for interactive participation. Unique to AES Dublin is the innovative session series “Student Hands-On Workshops and Master Classes on Immersive Audio,” which offers the opportunity to learn practical, new skills from experts in the field while implementing the latest immersive audio technologies. In addition, the session “Creating Audio Plugins with MATLAB” will examine the practical development of DSP code-based product development, along with the technical foundations needed to enter the AES MATLAB Plugin Student Competition, scheduled to take place at the 147th International Convention in New York City in October. The AES Dublin Student Recording Critiques, Student Recording Competitions and the Saul Walker Student Design Competition events provide interactive, professional evaluations of student work in recording production and audio technology product design, along with recognition and rewards for top projects. For students and professionals looking for their next level of education or career opportunity in audio engineering, the open-to-all AES Dublin Education and Career Fair offers an international mix of professional audio companies and institutions looking for the best and brightest upcoming minds in the audio world. Offering the chance to network with fellow students, prospective employers, educators and other industry professionals, the Education and Career Fair is an ideal environment for attendees to find a path forward toward fulfilling their audio aspirations. To take advantage of all of AES Dublin’s Student and Career Development events, you must register for an All Access badge. The full slate of student activities is listed at the online program Students/Career page. For more information about AES Dublin, and to register now, visit aeseurope.com. Papers, Tutorials, Workshops and more set for the premier European pro audio event of the year — 146th International AES Convention in Dublin, Ireland, March 20 -- 23. Details for the Technical Program of the upcoming 146thInternational AES Convention in Dublin, Ireland, March 20 – 23, are now available online at the convention site aeseurope.com. Taking place at the Convention Centre Dublin, just minutes from the technology and finance hub of the city, this year’s European AES Convention will provide a venue for presentations led by industry experts offering research Papers, Workshops, Tutorials, Product Demonstrations and more covering all things audio. Exemplifying the show’s theme, “Excite Your Ears,” AES Dublin will host exclusive presentations and technology showcases in the fields of Studio Recording, Live Sound, Networked Audio, Broadcast & Streaming, Music Production, Post Production, Game Audio, Spatial Sound, Audio for AR/VR/XR, Product Development and more. Advance Registration pricing, with additional AES Member and Student discounts, is available for a limited time with online Advance Registration. Representing the core of the Audio Engineering Society’s scientific and technological leadership since the Society’s inception 70 years ago, research paper sessions, such as those offered at the AES Dublin Convention, offer detailed insight from top developers and pioneers in audio engineering. Additional Engineering Brief sessions will also cover practical experiments across a range of topics ranging from architectural acoustics to spatial audio encoders, in a series of topical overviews. AES Dublin will also host over thirty Tutorials sessions during the four days of events, featuring expert presenters from around the world. AES Dublin’s Tutorial series will cover audio fundamentals and advanced concepts including recording and production case studies, spatial audio design and implementation and the integration of new audio tools and technologies. Specific applications ranging from dance music production to recording an orchestra, car audio, signal processing and beyond, will also be examined. Convention Workshops will also be a highlight of the AES Dublin Technical Program, presented in a moderated panel discussion format led by renowned AES Members and practitioners of the audio arts, including experts from top industry brands and leading educational facilities. Workshop presentations will include topics such as “Audio, Accessibility, and the Creative Industries,”“Media Preservation and Recovery,”“Mix It! Are There Best Mixing Practices?” and a session titled “Two Albums/Two Years – Kevin Killen on the Creation of a Couple of Masterworks, The Unforgettable Fire (U2) & So (Peter Gabriel),” hosted by AES Past President Alex Case. For complete details on these and AES Dublin Special Events, Technical Tours, Student & Career events and more, visit the Convention calendar of events. For further information and to register now, visit aeseurope.com. AES Dublin Convention Keynote Speaker Stefania Serafin to address the sonic Interactions of sound, music and technology in "Inclusive Sonic Interactions" address. The Audio Engineering Society, celebrating over 70 years of audio science and innovation, is gearing up to host the 146th International Audio Engineering Society Convention, March 20 – 23 at the Convention Centre in Dublin, Ireland. As part of the Opening Ceremonies, Stefania Serafin, professor in sonic interaction design at Aalborg University Copenhagen, will examine the intersection of audio and technology in the address “Inclusive Sonic Interaction.” This presentation, part of the AES Dublin Special Events series, is open to all attendees and will set the stage for four full days of immersion in audio technology and its application. 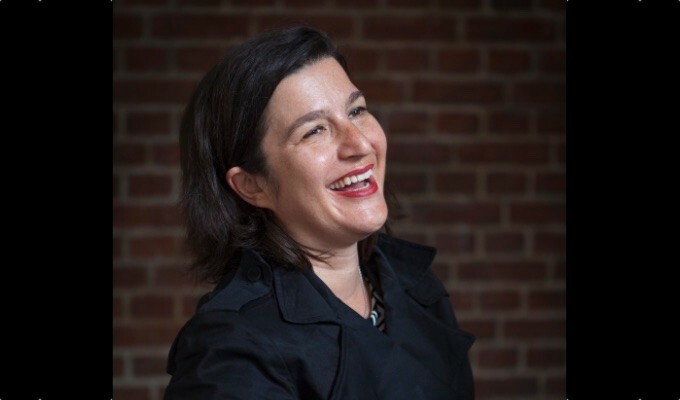 In addition to her design work at Aalborg University, where she leads the multisensory experience lab, Serafin received a PhD from CCRMA, Stanford University in 2004 and is the president of the Sound and Music Computing Association. 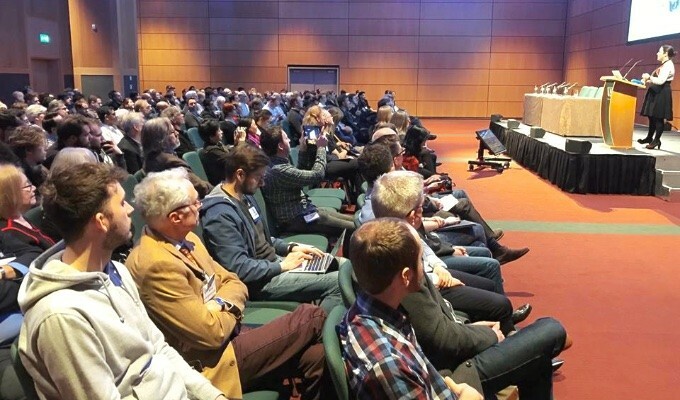 Dublin is the 2019 destination for Europe’s preeminent professional audio education and networking event – the 146th International Audio Engineering Society Convention, March 20 – 23 at the Dublin Convention Centre. Covering all things audio, from Studio Recording, Live Sound, Networked Audio, Broadcast & Streaming, Music Production, Post Production, Game Audio, Spatial Sound, Audio for AR/VR/XR and Product Development, the AES Dublin Convention will offer attendees exclusive opportunities and interactions with the top names in audio engineering and technology. Whether you are a professional engineer, researcher, educator, student or enthusiast, make plans to “Listen, Learn and Connect” with us and take your audio engineering knowledge to the next level. Register now at aeseurope.com. The AES announces the ascension of Nadja Wallaszkovits to the office of President, taking on the role as of January 1, 2019. 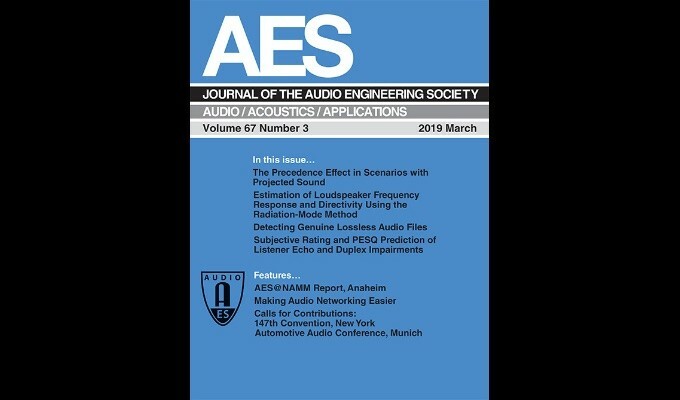 “Having worked with Nadja for many years as part of the AES team, we look forward to having her serve in the role of president, as the Society continues our mission to promote science and education in the field of audio engineering,” states AES Past-President David Scheirman. “Nadja’s knowledge of audio engineering technologies and experience within the AES will be a valuable asset in the coming year. Wallaszkovits’s 25-plus-year involvement with the Audio Engineering Society has included serving as vice chair of the Austrian section and on the Technical Committee on Archiving Restoration and Digital Libraries, as well as working in Standards on the SC-07 Subcommittee on Metadata for Audio. She served as Convention Co-Chair and received AES Board of Governors Awards for her work on both the 142nd (Berlin) and 144th (Milan) AES International Conventions. For the past year, Wallaszkovits has served on the Executive Committee of the AES Board of Governors’ Executive Committee as President-Elect. Wallaszkovits studied ethnomusicology at the University of Vienna before joining the Austrian Academy of Sciences in 2005. She currently holds the position of Chief Audio Engineer at the Academy’s Phonogrammarchiv. She recently took over the management of a Public Private Partnership collaboration between the Phonogrammarchiv and NOA Gmbh that is dedicated to the restoration of acetate media. Wallaszkovits also holds the position of vice chair of the Technical Committee of the International Association of Sound Archives (IASA) and is a member of the Training and Education Committee of IASA. Additional AES committee experience includes the Board of Governors and its Executive Committee, Awards, Conference Policy, Convention Policy, Education, Finance, Laws & Resolutions, Membership, Nominations, Regions & Sections, Diversity & Inclusion, Associate Technical Editors and the organizing committee for the AES 145th International Convention in New York City. 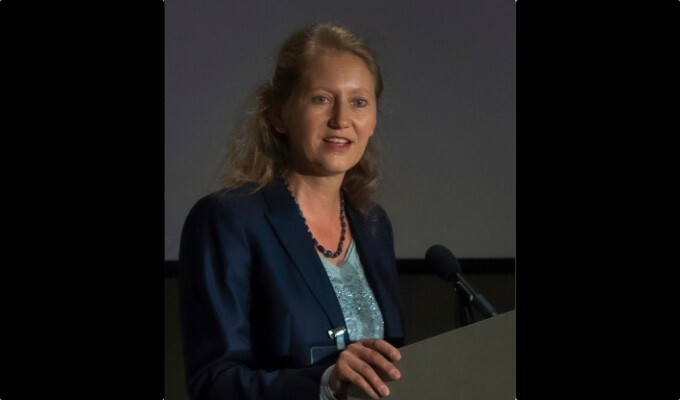 Read Nadja Wallaszkovits’s AES Presidents Message here and learn more about how you can be a part of the AES at aes.org.